No. 51. Marne - Formé en 1790 d'une partie de la Champagne. Ce territoire à été le theâtre de nombreux évenements historiques: défaite d'Attila, baptisme de Clovis, sacre des rois de France, prédication de la seconde croisade, invasion de Charles Quint, Guerres de la Révolution et de l'empire, Guerre de 1870 et de 1914. Victoire de la Marne. Reims est décorée de la Légion d'Honneur. CÉLÉBRITÉS: Urbain II pape; Colbert; St. Jean-Batiste de la Salle. CURIOSITÉS: Cathédrale de Reims, église N.D. de l'Épines à Chalons, chateau de Montmort, vignobles et caves. PRODUITS: Céreales, cerises, betteraves, élevage, moutons, tonnellerie, bouchons, lainage, blanc d'Espagne, vin de champagne, biscuits. Station thermale: Sermaize. No. 51 Marne - Formed in 1790 from part of Champagne. This area was the scene of many historic events: defeat of Attila, baptism of Clovis, the coronation of the kings of France, preaching the Second Crusade, invasion of Charles V, Wars of the Revolution and the Empire, War of 1870 and 1914. Victory of the Marne. Reims is decorated with the Legion d'Honneur. CELEBRITIES: Pope Urban II; Colbert; St. Jean-Baptiste de la Salle. SITES: Reims Cathedral, Church of Our Lady of the Thorns in Chalons, Montmort Castle, vineyards and wineries. 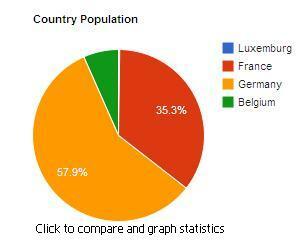 PRODUCTS: Cereals, cherries, beets, livestock, sheep, cooperage, caps, wool, Spanish white wine, champagne, cookies. Spa: Sermaize. 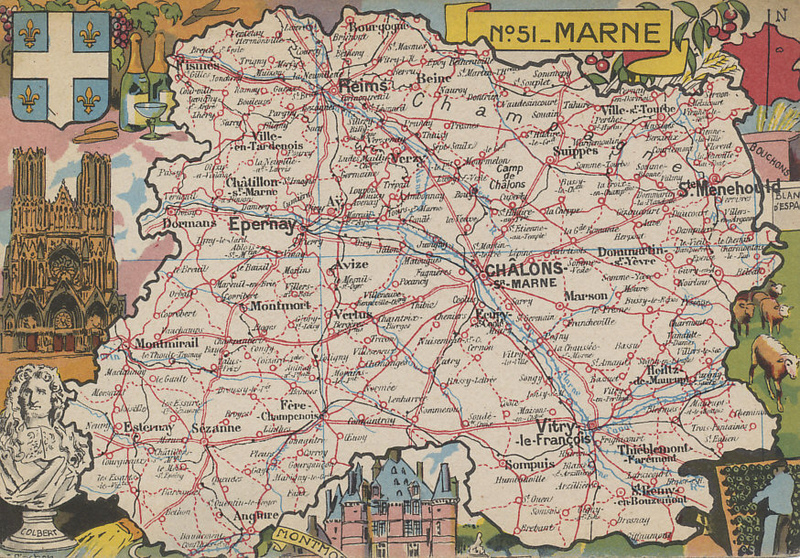 A region and départment of France through which flows the Rivers Marne, Aisne, and Vesle. The principal city is Reims with its great cathedral. 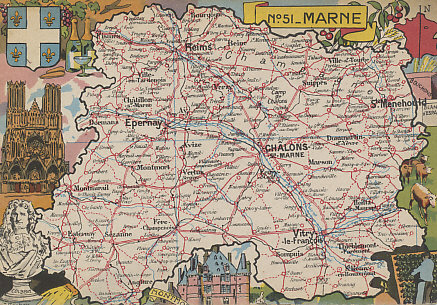 The region was one of the primary French battlegrounds of the war. After their defeat on the Marne, German forces retreated to the Aisne River in the Race to the Sea. The First Battle of the Aisne was fought in 1914. 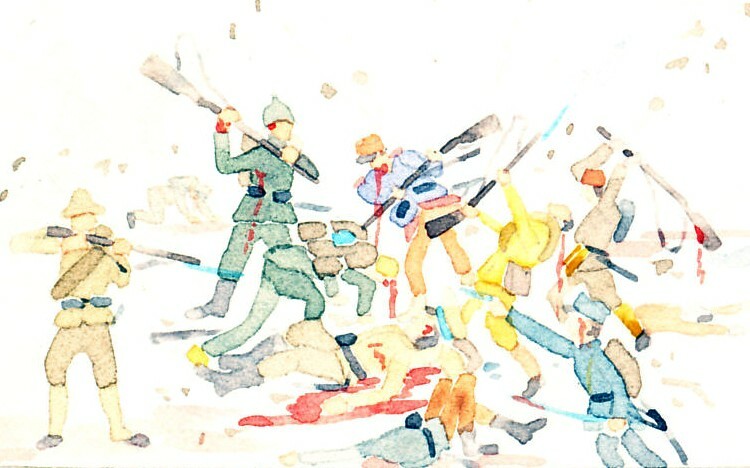 Trying to break through the German line, and testing its strength, the French attacked repeatedly in the First Battle of Champagne from December 20, 1914 to March 17, 1915. This included a German counter-offensive in January at Soissons in the Aisne départment to the west. The Second Battle of Champagne, was the major French offensive in the great Franco-British offensive in Champagne and Artois in autumn 1915. The Second Battle of the Aisne along Chemin des Dames was the largest and final assault of General Robert Nivelle's disastrous offensive in the spring of 1917. In their great advance of 1918, German forces launched the Aisne Offensive, the third of five German drives in 1918. In July, 1918, Marshall Foch launched the Franco-American Aisne Offensive. 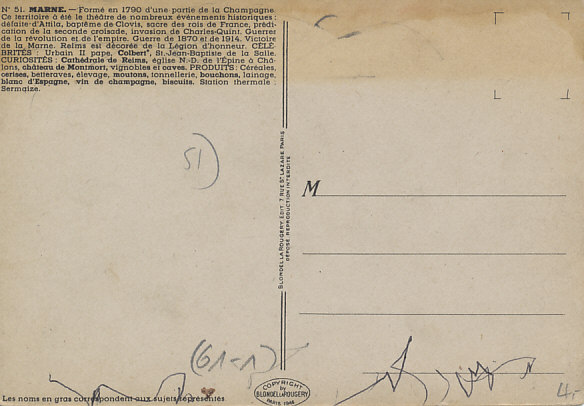 Champagne is a region in France.